It’s the height of the beach season here in the Cape Region. That means that many golfers will find themselves surrounded by acres of sand, with nary a golf course in sight—at least, for part of the time they spend here. While they sit on the beach, exposing body parts that usually don’t see any sunlight, such as their feet and their bellies, some of these golfers might also enjoy a couple golf books that won’t tax their sun-fried brains. 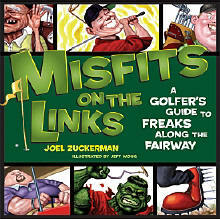 These can be read in a single tanning session, such as Joel Zuckerman’s Misfits on the Links: A golfer’s guide to freaks along the fairway (Andrews McMeel, $9.95 SRP). 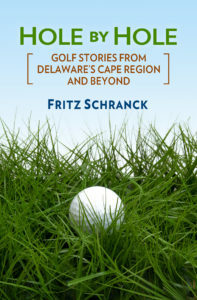 Zuckerman is a golf and travel writer in his regular line of work. During years of checking out golf courses and resorts, he also couldn’t help noticing that many other guests tended to conform to one of a wide assortment of personality types. Most of these types are not the kind one would like to emulate, or be accused of being, or even be around with for very long. Nonetheless, Zuckerman managed to put a mostly light touch on this comic satire of some flawed folks he’s been partnered with. Jeff Wong did the illustrations that fit perfectly with the descriptions. His caricatures called to mind some of the fine artwork I used to see in Mad Magazine a long time ago. Each type is given a regular title along with a mock-scientific label, such as The Gadget Geek (Technus obsessus). A paragraph or two lays out the broad outlines, and the drawings are accompanied by a few more pungent comments that, for some, may bring out a rueful nod of self-recognition. Zuckerman saves his best vitriol for some truly wretched characters on the links, such as sandbaggers, other kinds of cheaters (Clintonicus Ante Foozle), and heavy drinkers. He’s far kinder to other personalities that don’t deserve harsh treatment, such as cart girls and the old guys who play well despite the absence of length in their game. Another beach book suitable for golfers is Jim Bronner and Bob Gilhooley’s collection of golf jokes and stories, How to Hit the Second Shot First: Blue and Bawdy Jokes that Unlock the Puzzle of the Green (Warner; $15.00 SRP). I’ve been golfing for a bit more than twenty years, and I can safely say that I have either heard or told over 90 per cent of what’s in this collection. Some are like old friends you haven’t heard from in a while. As soon as you read the first few words, all the old memories come back of when you first heard the joke or told it yourself to an appreciative audience. Some are far less familiar, and need a little more reading before you remember that you heard this one before. Others are brand-new, and should be a pleasant addition for your next top-this-one competition with your regular foursome. Most are also not repeatable here; not so much because of copyright issues, but because this is a family-friendly newspaper. As a sociological matter, parts of the collection show that a lot of male golfers may have, as they say, some issues with their spouses. The sheer number of jokes centering around adultery, cuckoldry, or the untimely demise of a marriage partner may signal something more than the usual use of humor to discuss taboo subjects. The book’s title refers to an odd little addition to the compilation. At various times certain words are highlighted in bold text. The reader is urged to combine the highlighted words into a blank form at the back of the book, and thereby learn the “secret” of successful golf. For the impatient among us, there is an alternative approach to solving the puzzle, but it’s hard for me to recommend this feature as a reason to buy the book. The book probably won’t be found in a treasured spot in the family library, but it may make an appearance on a beach blanket near you. If you see it, keep it away from the kids.